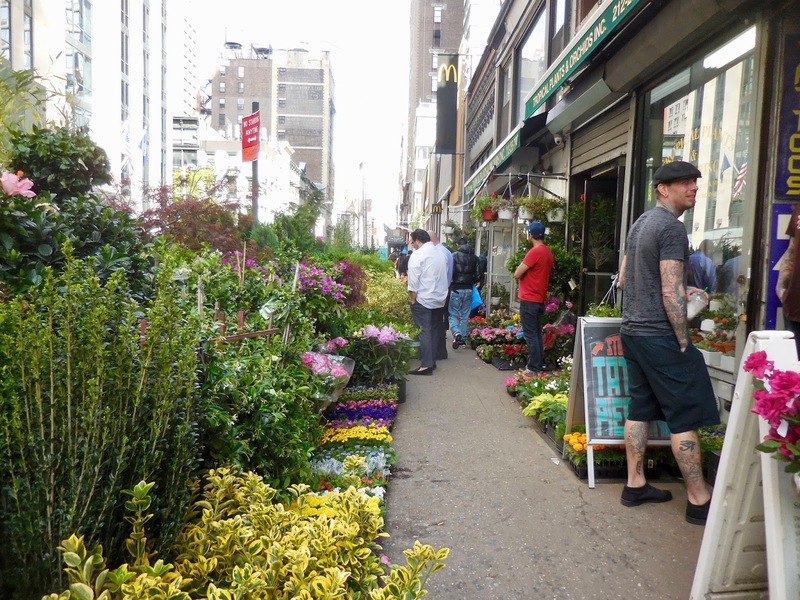 In the Flower District, along West 28th Street between 6th and 7th, the fragrant green jungle of the sidewalks continues to vanish. It's a big one: 45 stories, 146,000 square feet, 522 rooms. 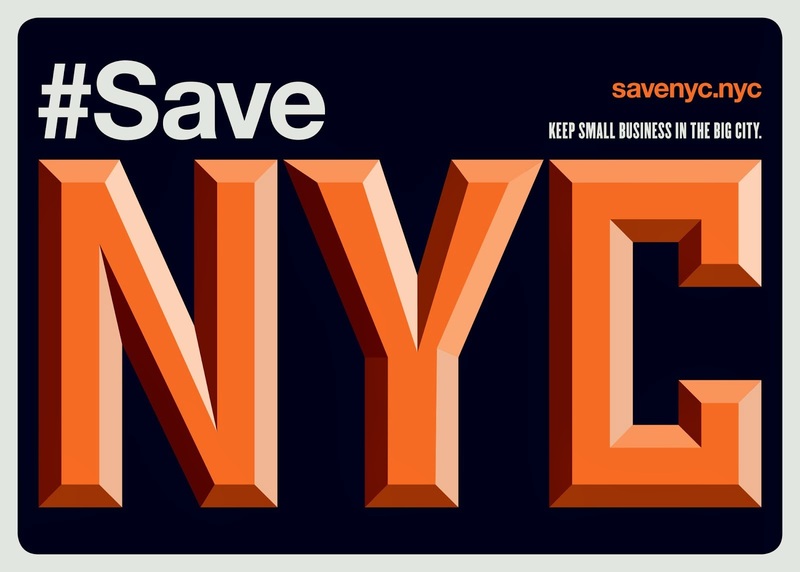 Said architect Gene Kaufman, “The demand for hotel rooms in Chelsea continues to grow, with ever larger and ever-taller hotels being constructed to accommodate the number of tourists wishing to stay in this vibrant neighborhood." This glass behemoth joins several more new tourist hotels here. In fact, the block is becoming nothing but hotels. I can't think of a worse death for what was a wonderful and unique little district. There are only a few green sections left. I walk through as often as I can, taking my time to smell the flowers. Literally. Right now, the place smells of gardenia. 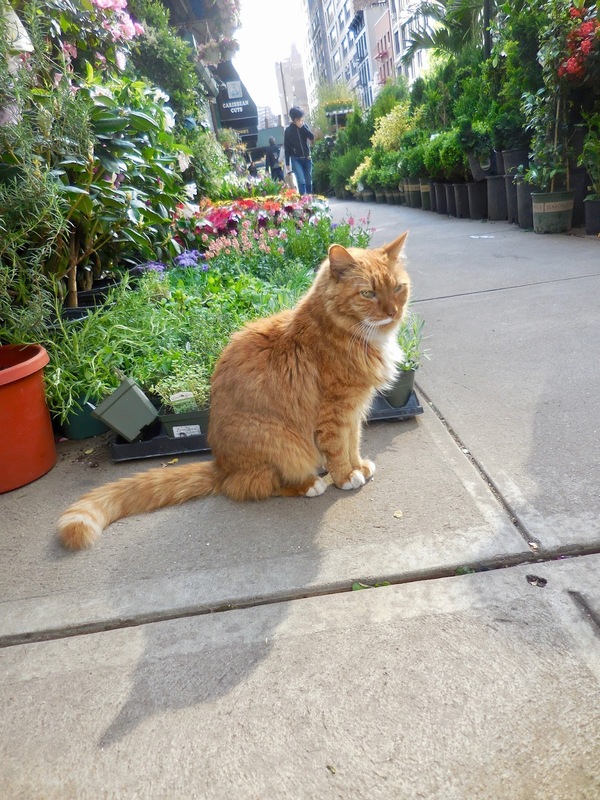 And there are the Flower District cats, at least six that I've counted, lounging among the succulents and orchids. This is life. This is real. This is New York. And it's being destroyed, like everywhere else, replaced by the dull and the dead. But it doesn't have to be this way. There are alternatives. Since the city can't or won't do anything to keep this (and other similar) districts alive, I wish the city would arrange to move them as a group to some other location. It might not be the best possible outcome but it's better than nothing -- which is what we're getting. When I worked in midtown, my morning walk around 7am took me through the flower district. It was the best part of each day and I relished walking along the jungled sidewalks, knowing I should appreciate it while it lasted. I loved everything about it - the beautiful color, fragrant flowers, the cats, the people busy at that hour in the streets. It was a real community where people knew each other and said good morning. What a shame to be replaced with anonymous glass facades for transients who will never know what they missed. 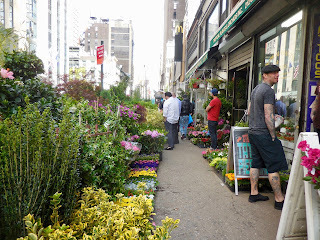 Yes, walking down that block between 7th and 6th still has a lot of flowers and plants spilling onto the sidewalk, so much that it can slow pedestrians down a lot. But the district was much bigger 20 years ago. I have many fond memories from the 70s of visiting this area. There were so many shops filled tropical trees and plants - the dead of winter was the best time to visit because some stores were like mini rainforests, all hot and humid and packed with tall palms. Sure the summer was great too, with the sidewalks and often the streets filled with green. 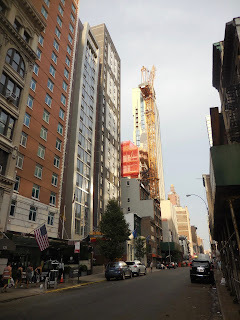 Over the decades I've seen this area destroyed by progress, as I did in Greenwich Village (East and West). I expect Manhattan to be the home of only the rich in a few more years, serviced by citizens like me who only come to pass and never get to thrive in its glory. I'm sure I'll be pushed out soon too, I can't afford to buy a home and the rents are disgusting. But the memories haven't faded a bit, so it's quite striking when you walk through an old neighborhood you thought you knew well, only to find yourself as a stranger - or worse, a tourist in a foreign land. On early Monday mornings, La Grenouille sets up its bouquets of flower arrangements for the week. The flowers are hand-picked by its owner, a couple of hours prior on that Monday morning, from the Flower District. La Grenouille is one of the few last remaining "Le" and "La" Gallic restaurants in NYC, withal, where they pride themselves on providing not only good food and greats service, but also the splendid ambience and atmosphere and elegance of dining-out; where one can feel majestic, regardless of their social and class status. What happens when the The Flower District, and the flowers, is gone, where would La Grenouille get its flowers? Or, what happens when the likes of La Grenouille are gone? Where would the remaining flowers from the Flower District go? Glad you noticed the overflow and over-saturation of hotels. Apparently, this crass city planning from Park Row took and still takes pertinent funding away from building affordable housing for the working poor. The tourist has become the constituent. 28st. is getting literally devoured by the tower pestilence and the transient overpopulation. Some stores are setting up plants by the bike lane on 6th avenue. What's funny is that Broadway around there has seen most of their office buildings turned into hotels and they are building 2 more. In a way, it's almost like what's being built there is another Times Square. 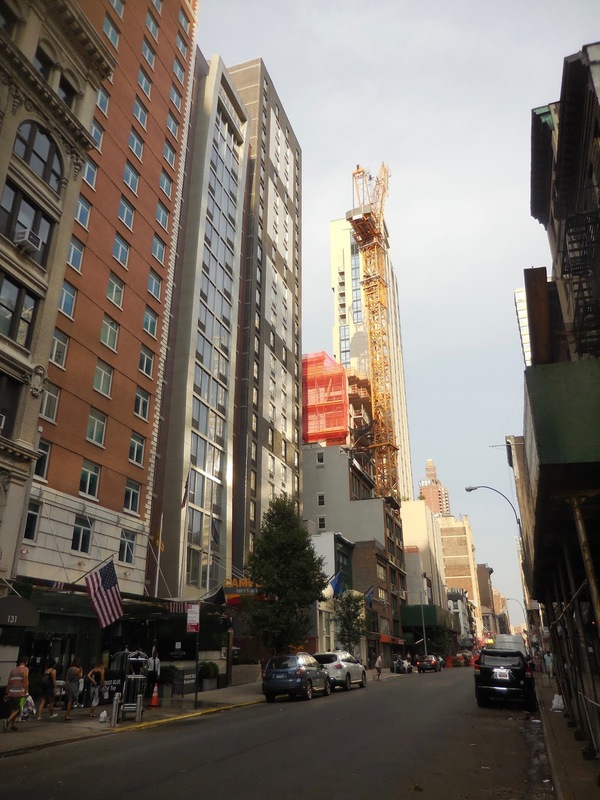 “The demand for hotel rooms in Chelsea continues to grow, with ever larger and ever-taller hotels being constructed to accommodate the number of tourists wishing to stay in this vibrant neighborhood." It won't be so vibrant when it is nothing but hotels and chains. The Flower District is rapidly losing its charm and the florists and related businesses are rapidly losing their livelihoods. If you’re interested in working with the developers of this site and others in the neighborhood to preserve the historical charm, quality of live, and economic opportunity, we want to hear from you.